You’ll likely hear about Cartagena long before you arrive. 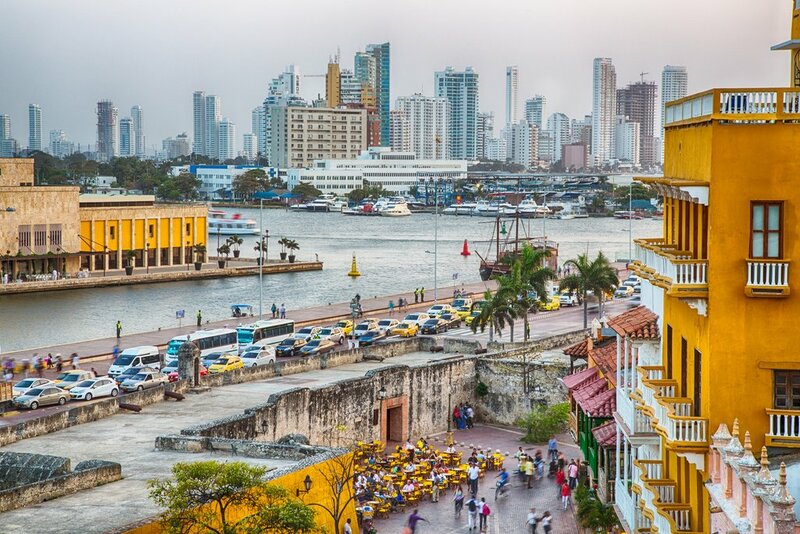 While the main attraction is the historic Old Town — packed with wonderfully preserved mansions and churches — Cartagena is much more than its colorful streets: it has highrise developments, long stretches of coast, offshore reefs and vibrant neighborhoods where locals express themselves through dance, food, and art. Here's our expert guide to help you navigate this romantic and high-energy Caribbean city. Cartagena, home to over a million people, has several distinct faces that visitors are likely to encounter. There’s the historic Old Town, modern skyscrapers in Boca Grande, working-class barrios, universities and a large port where cruise ships dock. In short, the historic hub occupies just a small slice of this large South American city. Colorfully-painted buildings in Old Town, Cartagena. 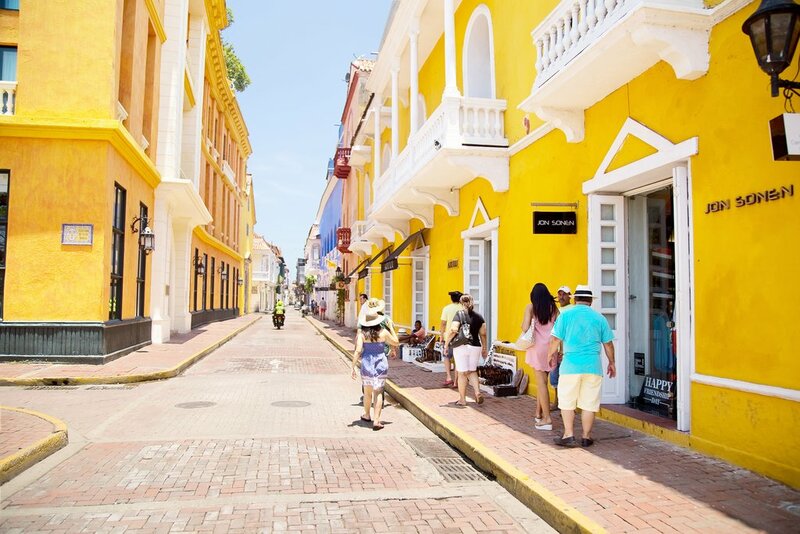 If you are traveling into Cartagena by bus, you’ll pass through many of its blue-collar neighborhoods as you make your way to the Old Town, the main area of interest to visitors. Located within an impressive 13 km of ancient fortifications, the Old Town is a World Heritage site with well-preserved buildings dating back to the 16th century. Today, many of the colonial-era buildings have been converted into shops, restaurants and boutique hotels. It contains two districts, El Centro to the west and San Diego to the northeast. The neighborhood to the south of the Walled City is Getsamaní. A few years ago neighborhood was a crime-ridden no-go zone but today it’s a revitalized area of cool cafes, graffiti-strewn alleys, street musicians and sultry dance halls. It’s certainly worth wandering through this vibrant neighborhood to experience daily life, especially around Plaza de Santisma Trinidad, where fruit sellers congregate and local kids play football. View of the modern Boca Grande area of Cartegena from old walled-city. Southwest of Getsamaní is Manga, an upper-middle-class residential area with some good restaurants. Farther south is Boca Grande, a modern and fashionable neighborhood of malls, movie theaters, and trendy cafes. It’s loaded with highrise hotels, many of them right on the beach. If you’ve been to Waikiki or Copacabana, you can imagine the local scene of beach umbrellas, sunbathers, and street vendors. This part of town also contains some medical facilities. It’s always hot and humid in Cartagena, with humidity usually around 80%. Throughout the year the average the temperature range is between 77°F and 87°F. Nights can be uncomfortable if your hotel does not have air-con. The weather is a bit better from January to March, when afternoon sea breezes provide daily relief. Cartagena averages 40 inches of rain each year with October the rainiest month. Due to the near constant heat, you don’t really need to plan according to the weather. If possible, you could avoid October due to the rain. If you can pick any period, then aim for the January to March window, when a steady breeze provides some relief. You may also want to avoid the holiday periods due to the crush of tourists and increased hotel costs. The peak season for tourism is December to mid-January, Holy Week (which can be in March or April), and the summer holiday period of mid-June to August. In December the locals celebrate the street art of Gesemaní. January: The Hay Festival which features classical music is held in January. February 2: Fiesta de Nuestra Senora de la Candelaria: this it the day of Cartagena’s patron saint and marked by a procession at the Convento de la Popa. Pilgrims flock to the Convent in the days leading up to the holiday. March: Cartagena has an international film festival the week before Easter. November 11: Concurso Nacional de Belleza: This date marks Cartagena Independence Day and the national beauty pageant. Big parties are held in the days leading up to November 11, including street parades and dancing. 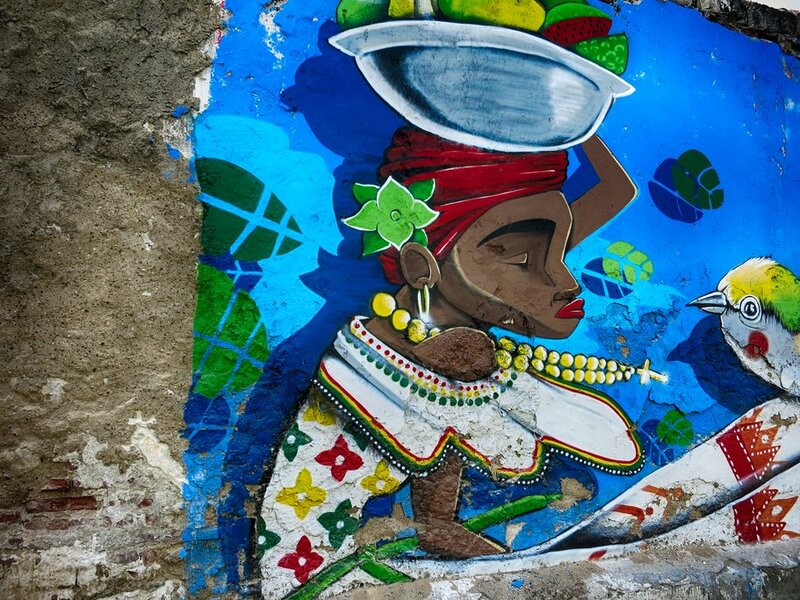 December: The Getsemaní Street Art Festival is held in the first week of December. 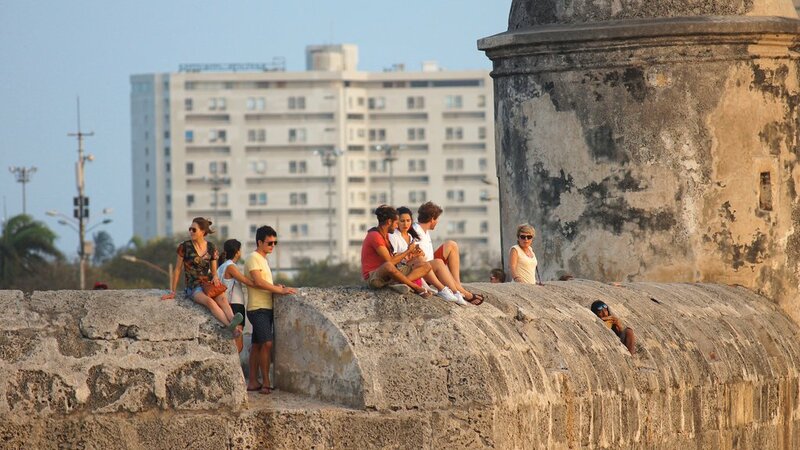 With a full day of sightseeing, you can see most of Cartagena’s historic places of interest and museums. But this is best done over two days as you’ll want to savor the history and energy of the Old Town as you walk between places. The heat is also likely to slow you down, and you’ll need to stop frequently for drinks and rest. Set aside another day to explore other parts of the city, such as the Getsamaní district and the Bazurto food market. By your third day in town, you’ll want to travel farther afield and can make a day or overnight trip out to the Rosario Islands, Baru or Playa Blanca. Another day allows you to visit the unusual Volcan de Totumo. If you are in vacation mode, it would be easy to spend two more days just relaxing, eating delicious seafood and soaking in the historic atmosphere of the place. So if you are tight on time, budget at least two days for the highlights. If you have more time to spare try to stay five days or more. Tourists enjoying the view from the top of the wall in the Old Town. 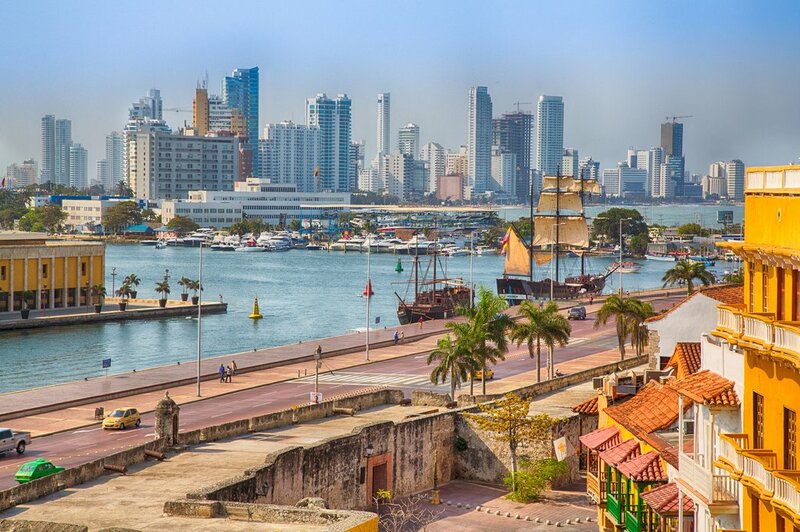 Cartagena has enough sights and activities to keep you occupied for several days. The main places of interest are located near the Old Town. There are museums and old mansions to visit and cobblestone streets to wander. In the evening you can clamber up the city walls that surround Old Town and watch the sunset. A great place to do this is from Cafe Del Mar, on the wall in El Centro. Another great option in the rooftop bar at the Movich Hotel. Outside the Old Town, it’s worth wandering around Plaza de la Trinidad in Getsemaní, where you can watch locals go about their daily lives amid graffiti-strewn walls. Or head down to Boca Grande to see a more modern side of Cartagena. There are food tours, walking tours and bike tours available through local tour operators. Cartagena is also a great place for a family holiday (this is one example), with many kid-friendly activities. You can even sign up for a night chiva bus ride that weaves its way around the city, serving alcohol and stopping off at nightclubs. Nightlife in Cartagena sizzles and if you plan on stepping out get ready for a heady night of great music, mojitos and dancing. Finally, don’t leave Cartagena without a day or two on the islands. The beaches within the city are located in Boca Grande, however, these beaches can be disappointing if you've come looking for a tropical paradise, so we recommend heading a bit further out of town to the nearby islands. Playa Blanca has a great beach and is one of the most convenient places to visit, although it can get crowded on weekends and like the beaches of Boca Grande has a lot of beach vendors. For a bit more peace and quiet, consider a trip to the Rosario Islands, an archipelago of 27 islands, reached by boat tours from Cartagena. If you don't have a lot of time a day trip to the islands is possible, but it's a much better option to spend a night at the islands for more time on the beach and less in the boat. You can find more info about island-hopping in this article. And for more day trip ideas from the city, look here. Cartagena receives many tourists and the local police, government, and tourist agencies are keen to keep them safe. While security is generally good, you still need to be cautious with your belongings. Be especially cautious when attending a street fair or festival when the large crowds make it more difficult for the police to look for pickpockets. Be extra vigilant when crossing streets as the traffic can be quite chaotic. Local drivers tend to not slow down for pedestrians so always give vehicles a wide berth. You should also confirm prices before signing up for a tour and getting services. Self-proclaimed tour guides may try to latch onto you at museums or historic sights, begin their spiel and then demand payment at the end. You’ll need to avoid them or plan to pay a small fee for their service. Cartagena has a lot of street peddlers and other folks trying to sell something and this can be a real annoyance. Most will leave you alone if wave them off with a No, Gracias (no thanks). Rafael Núñez International Airport (CTG) serves Cartegena. It is well-served by airlines flying in from the eastern part of the United States, plus a few direct flights from Europe. The airport is just 6 km northwest of the Old Town. In addition to taxis and local buses that connect the airport with downtown, you can also take an air-conditioned shuttle known as Metrocar. Cartagena’s main bus station is on the outskirts of the city and a trip here takes about 45 minutes from the Old Town. Standard sleeper buses are available to most major cities and small destinations. 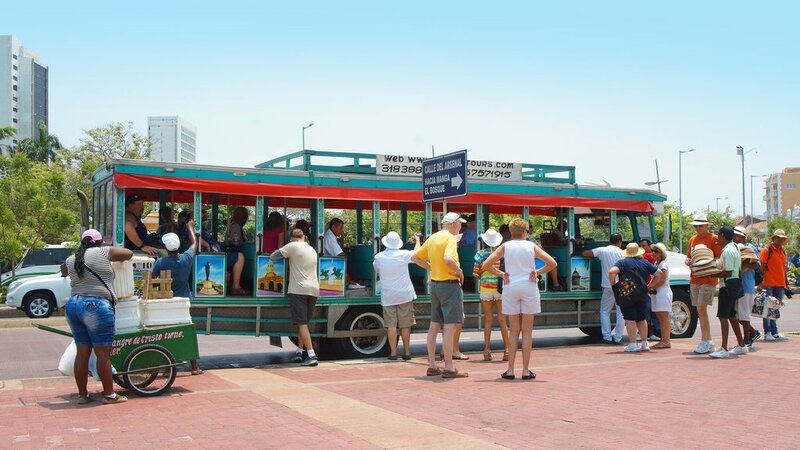 If you are headed to Barranquilla or Santa Marta, we recommend taking an air-conditioned shuttle bus, which departs from the Berlinastur Terminal, just north of the city center. Tour buses painted like chivas are one way to see the sights of Cartagena. Downtown is easily walkable. However, if you want a romantic and fun way to see the Old Town, consider taking a tour in the back of a horse-drawn carriage. For short trips to places like Boca Grande, you can take a taxi, which is a safe and affordable mode of local transport. When ordering a taxi, do it through your hotel, as taxi drivers may try to increase the fare if you get a cab off the street. Another option is the TransCaribe, a BRT system based on the TransMilenio in Bogotá. Attractions served by the TransCaribe include the Convento de la Popa, Mercado Bazurto and San Felipe de Barajas. Cheap busetas travel all around the city, but these are difficult to navigate for newcomers. Consider taking one only if you can get good local advice on your route before setting off. Tour buses designed like chiva buses are also available for people on a driving tour of the city. In terms of taxis, it's best to have your hotel call one whenever possible. Taxis are not metered in Cartagena, so the fare needs to be agreed upon upfront. Even so, many drivers will still quote 3000-4000 pesos more to tourists than they would a local, so ask your guide or concierge what fare to expect before calling a cab. Most visitors will want to stay in the Old Town, a great base for exploring the best this city has to offer. The Old Town has accommodation to fit all budgets, with hostels, boutique hotels, and luxury options. Most of the top end places are located in the El Centro and San Diego sections of Old Town. A few lower cost boutique hotels and hostels can be found in Getsemaní. Cartagena has no shortage of hotels with fantastic pools—here are nine to choose from. The international chain hotels are mostly found in Boca Grande, including an enormous Hilton Hotel & Resort; this article lists a few more that will work for travelers with kids in tow. Diners are spoilt for choice in Cartagena. You can even find tasty meals at street stalls and markets. Common street food includes arepas de huevo (fried corn disc stuffed with an egg), empanadas, and buñuelos (deep-fried maize and cheese balls). Also try the papas rellenas (potatoes stuffed with meat and spices). Fruit stalls are also common in main commercial areas. In La Boquilla, you can order wallet-friendly seafood meals at locally-owned beach shacks. (Here are a few more great street foods to try while you're at it.) If you're traveling with kids, take a look at this list of family-friendly restaurants. Moving up the ladder, you’ll find excellent restaurants to serve all tastes and budgets in the Old Town, Getsamaní and Boca Grande. In addition to the restaurants, some of the upscale boutique hotels serve wonderful gourmet meals. The city is not surprisingly strong on seafood. One stand out seafood restaurant is La Cevicheria, serving what most locals agree is the best ceviches in town. Looking for a caffeine fix? These cafés are the best in town. As a touristy city, local shopkeepers and taxi drivers may assume you've just stepped off a cruise ship and are unfamiliar with the local prices. Therefore, it's a good idea to have a feel for the prices of goods, services, and taxis before bringing out your wallet. Gentle haggling is usually required. Most shops and restaurants take credit cards but it's also a good idea to have some small cash on hand for taxi rides and street snacks. Banks give the best rates while the rates at the airport are generally poor. Getting a reservation at a fine dining restaurant in Cartagena can be difficult, especially in the high season. It's a good idea to book ahead a week or two before your arrival. You can do this by emailing the restaurant through their website. A lot of shops in Cartagena sell emeralds, but you need to know your stuff as a lot of the jewels for sale are fake. Buyer beware.